​There is a legacy of museums celebrating the great scientific achievements of women; their leadership in commerce, their inventiveness in design, all essentially aimed at asserting their equality and competitiveness with men. 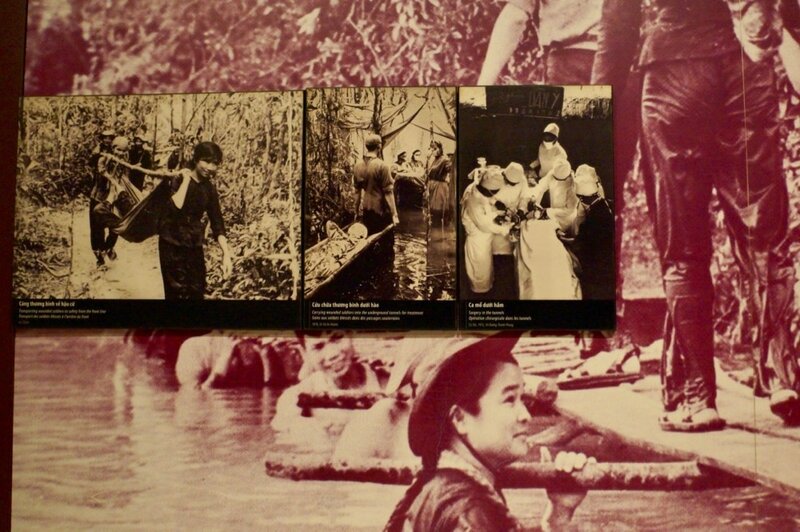 ​In Hanoi, the memory of the equal role of Vietnamese women in every aspect of creating the nation from the daily hardships of agriculture to the explosive misery of hand to hand combat in war paints a different page in the realm of women’s museums. Those of us who grew up in the 60s and 70s will never forget the Stalinist posters using the images of women, rifle in one hand and the other, a closed fist shaking at the sky. I know in North America we thought of it as at the usual propaganda in the same mode as Mary the Welder in World War 2 propaganda but here in Vietnam this as all true. The incredible achievement of the Ho Chi Minh Trail moving vast amounts of war materials, hundreds and hundreds of kilometres from the north of Vietnam to the south through jungles were on the backs or on the arms of not just the men but the women as well. You can read about this and view the pictures in this link. But, of course, in the Vietnamese Women's Museum there’ s much more than that. The Museum was founded by the Socialist Republic of Viet Nam in 1987 as an entity within the Vietnam Women's Union which currently runs the Museum. The construction of the building it is housed in now started in 1991 but it was only in 1995 when it opened to the public and showcased its collection of about 28,000 artefacts and items all belonging to women who were mostly known to the Union and and have shared their stories that now have become treasured memories. 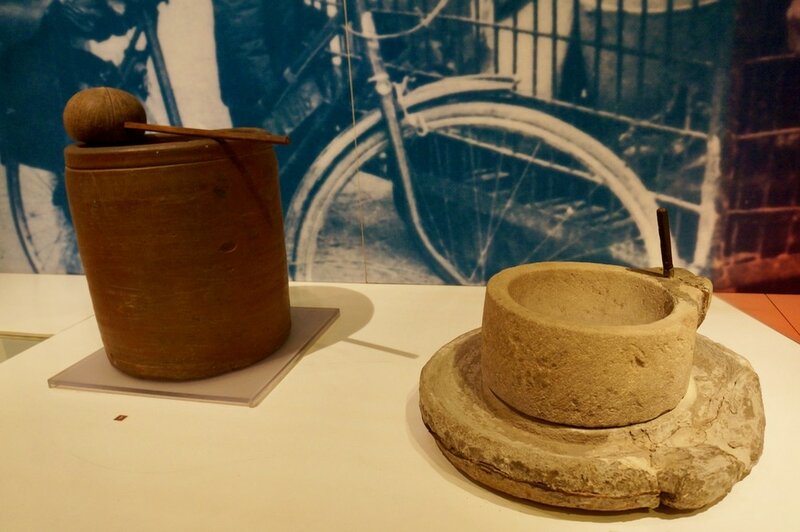 The items included are those used by women in the many rituals practiced around family and social life as well as those which showed the Vietnamese women's effort to protect and defend their homeland. 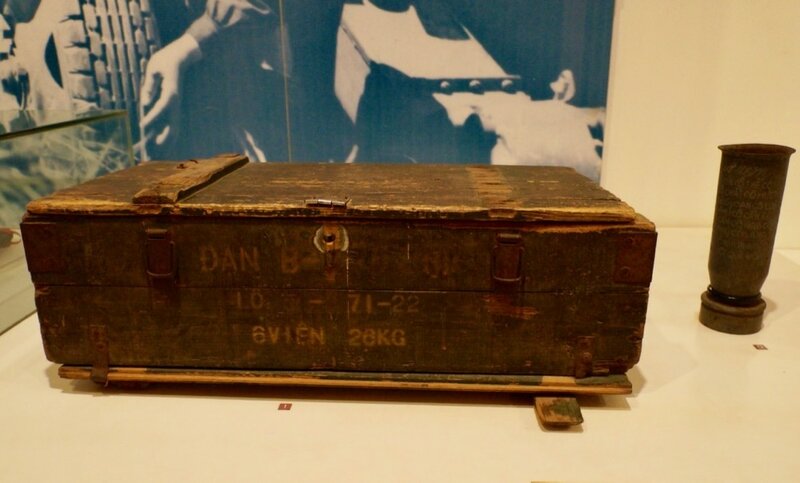 A very good example is this ammunition box on display today at the Museum. The Museum has 3 permanent displays: Women and Family, Women in History, and Women's Fashion. In addition, it has special exhibitions, online and mobile ones which showcase in the various provinces. Special exhibitions in the past included Stories of Markets, Women and Innovation, and Flowers and Life. Online exhibitions are intended to reach those who cannot travel to the Museum. I had a chance to view the current online exhibition on the Street Vendors and it was very touching to listen to their stories. Since then, when I meet some of the vendors in the streets of Hanoi, I feel more for them having heard of their life; how much they earn, the long hours they kept, their sacrifice of being away from their families. 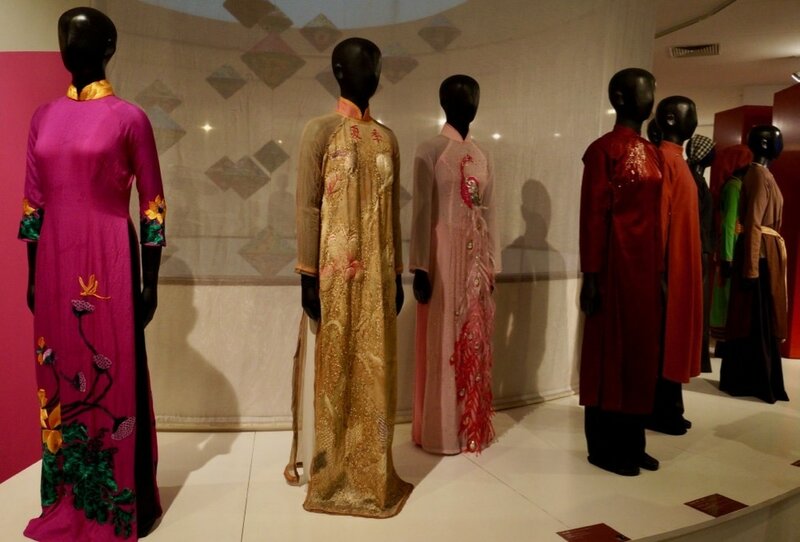 ​The Museum highlights the role women play in Vietnamese society as woman, wife, mother and the rituals that go with their major roles such as the ones around pregnancy and birth. There are unique rituals in the different ethnic groups. Other displays are on the tasks women do in everyday life other than raising children such as agriculture, foraging, fishing, pottery, sewing and weaving. This includes practices and items used by the women in these daily tasks. But what really struck me is the worship of the Mother Goddess, popular in Vietnamese culture especially in the north where the Goddess takes on 3 different incarnations: The Goddess of Heaven, Water and Earth and Mountains and Forests. 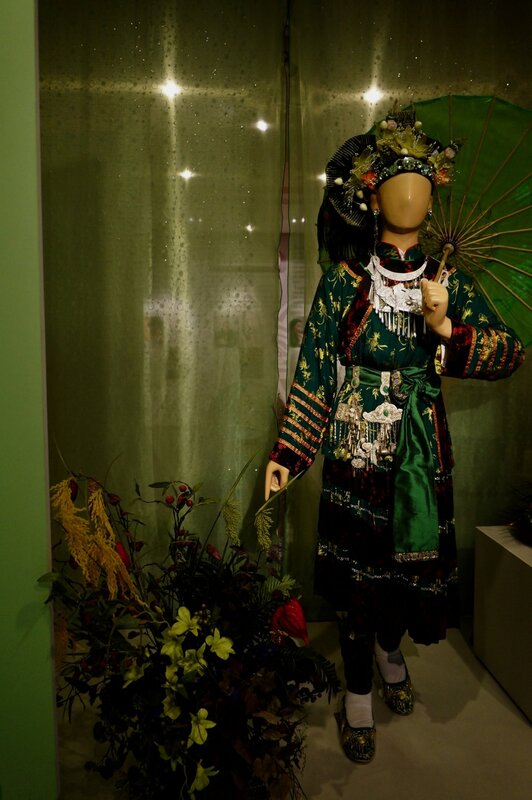 Here's an exhibit of this incarnation of the Goddess of the Mountains and the Forest. The second level in the Museum is dedicated to Women in History. Here, the women who gave of their lives for the homeland are honoured. Displayed are some of the pictures of women who were actively involved in the war and the items they used in their fight for the country. 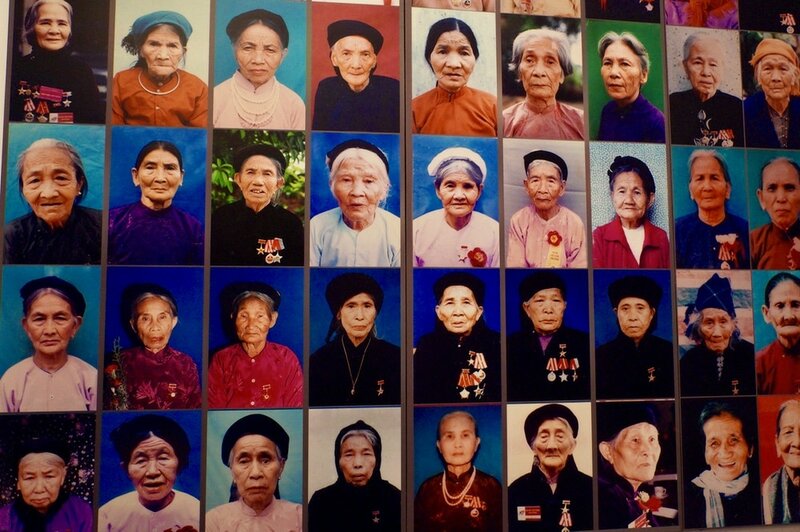 Vietnamese women were just as involved as the men in Vietnam's fight for independence. As the women could easily sneak through the Americans, they smuggled weapons which they often placed underneath their cargo of fish sauce, the smell of which is so appalling to the Americans. They also passed on information and guided the Vietnamese men to find the American camps. They were adept at personifying various roles, that of teacher, vendor or farmer and had the costumes to accompany these roles. The one costume they stayed away from was the black top the Americans associated with the VCs. The women in the villages played their part. They dug trenches, built tunnels and trained themselves to use weapons. And they did all these not just during the American War but earlier in the fight against the French where many women also suffered and languished in prison for being revolutionaries. 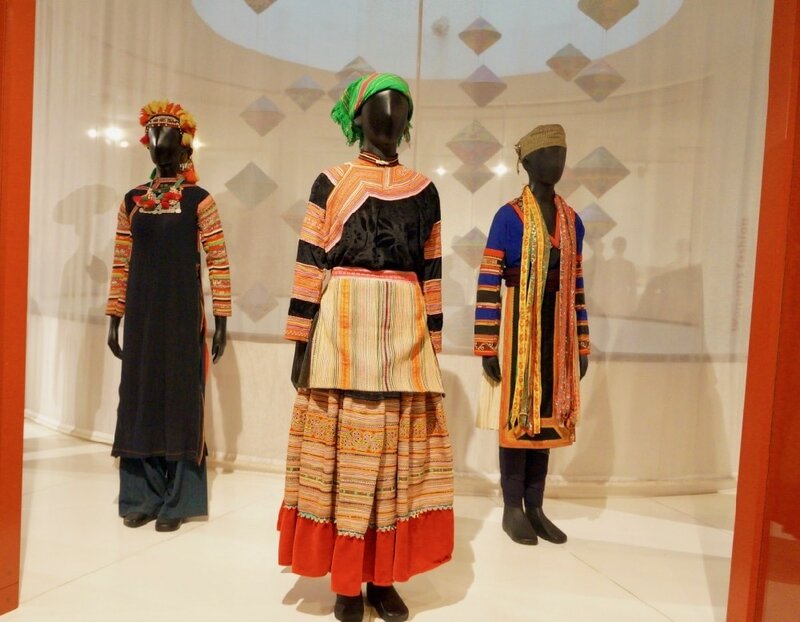 The third level of the Museum is dedicated to showing the unique costumes and accessories of Vietnam's 54 ethnic minorities including batik, beads, dyes, hemp and other more contemporary Vietnamese designs. 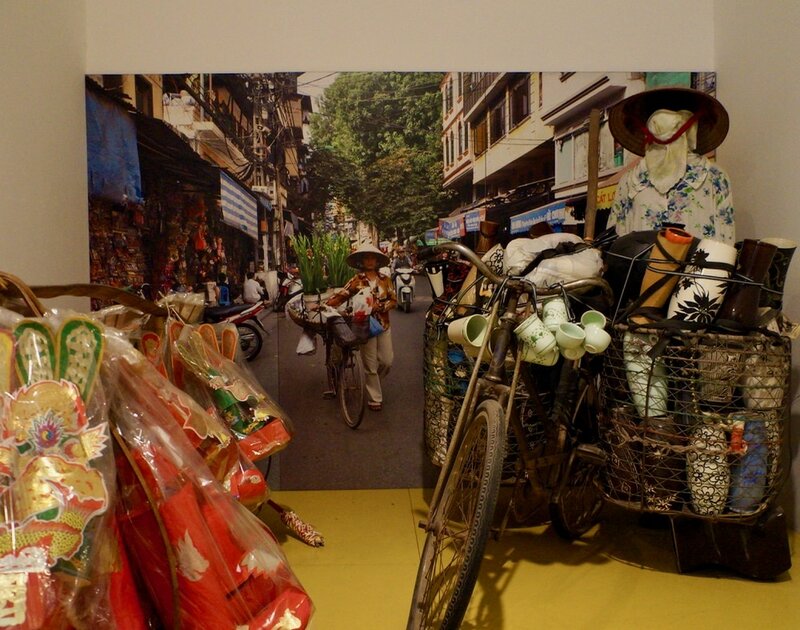 In 2010, the Museum opened the Discovery Room to encourage younger Vietnamese from 7-15 to do more exploration, research and other creative activities. More programs are now explored to utilize the educational resources of the Museum. 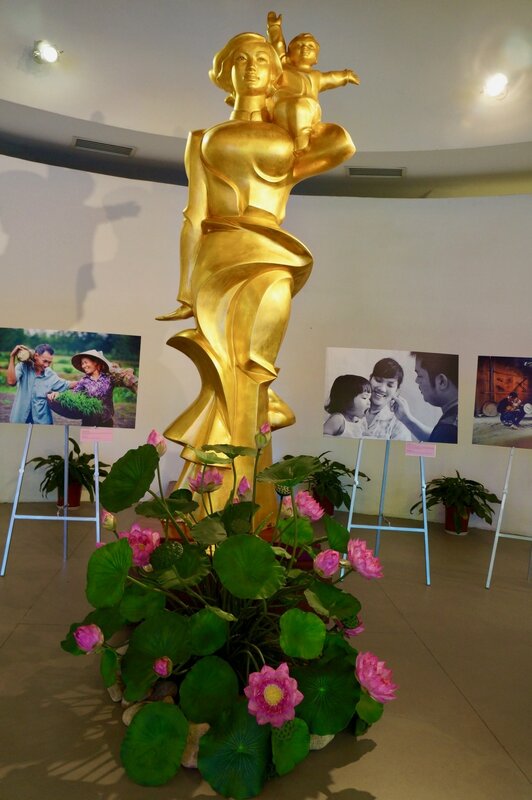 It will continue to be a fine tribute to the power and strength of the Vietnamese women. On your planned trip to the Museum, it is better to call or check their website just in case there are changes to the schedule.